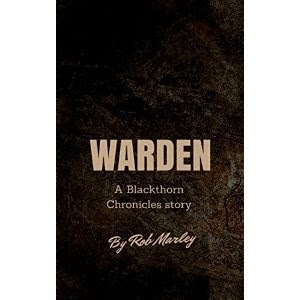 Today we are interviewing Rob Marley, author of the historical fantasy novelette Warden (A Blackthorn Chronicles story). Well, I've got a few years writing for fun experience, and a fair bit of ghostwriting too. For me writing is recreational: because some stories are too good to just leave floating in your head. Unless rain and bad accents interests you then the fact I'm from England etc. isn't much to talk about, but I will mention I work hard at all the work I produce for people to read, it's a passion, definitely. Describe your novelette, Warden, in a few sentences. Isaac, ex soldier, he's a priest now, but when his small town of Riverfield is attacked by elves, he's pushed out of that life and with a young girl named Maria, fights to save innocent people. Maria herself is a young protagonist, new to Riverfield, and new to a life of action, everything is changing for her and she does her best to keep up. The story is driven by a need for these two, and others, to ignore their personal feelings about war and action, and do what is needed to protect the people who don't deserve a fate coming for them. Who do you think would most appreciate this novelette? At the risk of being obvious, fantasy and historical fiction readers, but the length of each novelette means that it's probably suited to people that like shorter bursts of reading. People who want to see something with the bits of fantasy they like, and a few breaths of fresh air in there as well. People who want to try out the genre but don't want to face the thickness of George R. R. Martin's work or Bernard Cornwell's novels, Warden is an opportunity. I think Warden presents a character for everyone to love, Maria is young and strong, Isaac is older and more cautious, but both of them have a fire inside them to achieve what is needed. What inspired you to write a story about people struggling to survive after an attack from outsiders? Because it's fun! When you create new characters, putting them through their paces and seeing how you want them to act shapes who they are as characters. Warden very much does that, taking two people who couldn't wish to be farther from the situations they're in and seeing exactly what happens when they're in them. Inspiration really came from daydreams after too many Game of Thrones episodes and history books, I've written pieces where the characters take ages to ground and face any challenge, when I decided to write Warden I wanted to push them from the very first, and give them a rest later on.... maybe. What can you tell us about the Blackthorn family? The Blackthorn family.... They rule the Thornlands, where this series takes place, and their hands steer paths that ripple throughout the land. Knowing who exactly they are at this point isn't too important, but knowing that the Blackthorn family is old, powerful and vigilant in the protection of their people is very, very important. It is possible, in future that the Blackthorn family will play a more personal role in the adventures of our protagonists, but for now they're very much above and behind the fog. What drew you to the historical fantasy genre? When I decided to publish my own work, I began thinking about how much I liked creating things in writing, and decided to make a whole world where I made the rules, the Empire, and the Thornlands were born. Historical fantasy just carries the best bits of my favorite genres, the action and grounding of the historical aspect, but the freedom and possibility that fantasy presents us. The world itself took hours upon hours of detailing to give it any credibility, there are hundreds of details in the world that I'll never write about, but I love it because I could create it anyway. In short, the enjoyment of the type of writing, and the fun of creation without limits. Tell us a bit about our protagonists, Isaac and Maria. Well, Isaac is in his forties... there's a lot unsaid about him but what I can make clear is he's reluctant to pick up the weapon again. When the story begins yu get to see a scene that shows how hard he is working to make peace with the life he had. In Warden you see a man who makes decisions he hates making, but doesn't hesitate for the good of the people, after all, good men make poor soldiers, and Isaac was not a poor soldier. Maria on the other hand, is young, and having moved up from the Thornland's capital, Silverkeep, only arrived in Riverfield just before... well you know. She might be petrified, and struggle to cope with a lot of the situations, but it would be a mistake to underestimate her. You have a lot of experience as a ghost writer. What made you decide to publish a work under your own name? Mostly the desire to see my work go up under my own name, or a pen name at least. I love writing and ghostwriting gave me the chance to practice and work at my skills, but I began writing because I liked creating things and I wanted to keep some of those creations for myself. Ghostwriting has done a lot for me, and still does, but at the end of the day I want to look at what I've achieved and see at least some of it under my name, so I can say 'I'm the author of...' rather than 'I'm a ghostwriter'. What genre of books did you work with as a ghost writer? A wide variety, which was really the beauty of it. I did/do a lot of work in modern and historical fantasy, though did I did some thriller, and some tragedy. I think I've dabbled in just about every popular genre, and even branched out into article writing at one point. Did your experience as a ghost writer make writing this novelette easier than it would have been otherwise? It certainly made me a lot more comfortable than I think it would have been, the experience I gained ghostwriting meant I didn't make as many first writer mistakes as I could have done, and it was easy to spot the ones I did make. Oh, by far Marshal Tulus, it's difficult because I have a definite favorite in book 2, but in Warden, Tulus is just so entertaining to write, and I hope, read. Style, style, style! I often worry about this and that, and getting what I want to say down on a page in a nice flowing manner is something I've been perfecting. Not worrying so much about having a rigid planning structure either, as George R. R. Martin said about Gardeners and Architects, I'm a 'gardener' I don't plan every detail when I start, I find characters I like and a plot that's interesting, I start there and keep going. How many novelettes do you have planned in the series? A fair few, definitely. I've just finished the manuscript for book 2, and the way each of the characters are developing is looking really good so far. The beauty of Isaac and Maria's story is there is so much happening in the world, that they can really go anywhere for adventures, and there's certainly plans in the works for them. Without giving too much away, what can readers expect from the next novelette and when will it be released? Well, one or two characters are introduced in Warden that aren't explored too much, in book 2 these characters become close to those already in the picture, whilst the interactions between them are coming off brilliantly, if I may say so myself. I'd say expect changes to the character's lives and development, both good and.... not so good. Also, expect more action, having finished book 2 I realised there is actually quite a lot of action involved, but there's also a lot more time to see just how it is all affecting the people involved, there are new relationships formed, and nurtured. Is there anything else you'd like potential readers to know about your novelette? Well, Warden is not a loner. Warden is the beginning of several character's story's, and a little bit of showing what these characters can achieve. If you like fantasy, you like action, and you like something that will stop you being bored, whilst supply you with something new, Warden is here. "How long ago was that?" Maria asked. "Oh about four years ago? It's gone quick it has…" Tulus paused for a second. "I protected that town for ten years. They've probably burnt it to the ground by now, they'll see the smoke for miles." There was a tear in his eye, Maria could see it herself even in the dark. Soon though she fell asleep, curled against the huge man for warmth and even, though she'd not admit it, a little comfort. Suddenly there was a voice. One of the sentries. "Stop! Identify yourself." Then, quieter. "By the God's, Isaac!" Maria woke startled. Tulus was on his feet in an instant followed by the rest of the soldiers; townspeople lifted their heads and Sergeant Hart began assuring people all was well. She strained her eyes, and saw in the crack between the rocks they'd come through, one of the sentries supported a taller figure as they made their way to the people. As they drew closer Maria gasped: Isaac's face was covered in blood, his expression barely present. He limped so badly one of the sentries had his arm around him, half carrying him. They reached Tulus and wordlessly Isaac dropped something at the Marshal's feet.